Facing a custody battle that threatens to rip his young son from his life, librarian Bronson McKinnon is hyper-vigilant, not wanting to give his ex-wife any ammunition to use against him in court. Kindergarten teacher Nash Spencer is fresh off a bad break-up. Meeting the handsome single father on the first day of school is the last thing his battered heart needs, but he’s drawn to Bronson. With the help of Bronson’s five year old, Tucker, the men start spending time together. 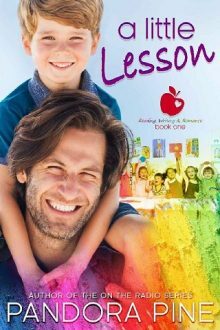 Despite Bronson’s fears of his sexuality costing him custody of his son, he can’t help developing feelings for his son’s teacher. When Tucker shows up to school with bruises, Nash is pulled into the court case, and the custody battle turns into an all-out war. Are Bronson’s and Nash’s feelings for each other strong enough to win the day or will their love become a casualty in Bronson’s fight to save his son?